While this may be the breakfast I wish I had the time to make, this is the breakfast I have most days right now, when so many delicious fruits are in season. I know that smoothies get a bad rap in some quarters for 'not being really fruit' or being too high in calories, but I say B.S. to that. As long as you know exactly what is in the smoothie, and you do not down smoothies as beverages to quench your thirst but take them as liquid meals, I think they are terrific ways of getting a lot of fruit inside of you or your loved ones. About 2 cups of cut up fruit, at least 2 kinds, whatever is ripe and sweet. 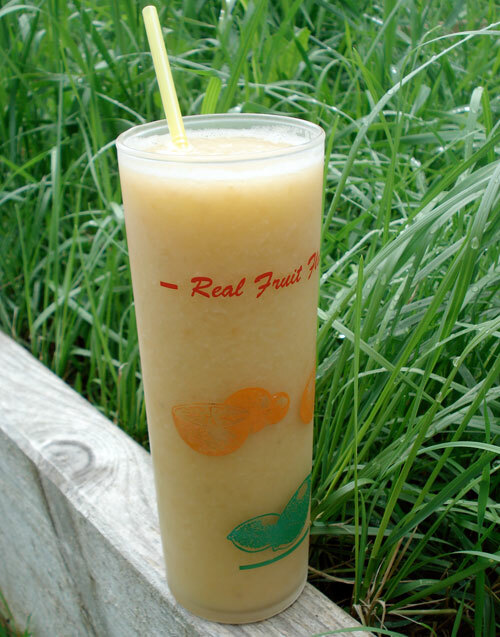 The smoothie in the photo has cantaloupe melon, peach, apricot and asian pear. All of this is blitzed in the food processor (you could use a blender too) until smooth. Water is added if it's too thick. Then we drink the fiber and all. No added sweeteners are needed if the fruit is ripe enough. The combination of fruit and soy milk is very filling, and holds me until lunchtime very well. It's really a summer-only luxury to be able to enjoy such naturally sweet, fruity smoothies, so I'm indulging in them as much as possible. Submitted by maki on 2008-07-14 16:32. I've been doing this with fresh ripe mango and it really is very filling and tasty. It's totally healthy too, unless you do what I did the other day and blend in a spoonful of Nutella! Summertime smoothies are a great start to the day. I also enjoy blending fruit, soy milk, and non-fat yogurt together. For extra fiber I add some hearty cereal to the top and eat this yummy concoction with a spoon. What a fast and easy breakfast to make! And I have some peaches that could do with being used up in the fridge.... mmm. would this work with regular milk too? looks delicious! I blended one and a half very ripe bananas along with one cup of diced pineapple (equaling a little over two cups). Also, I used almond milk instead of soy milk because it taste so much better. Thanks for this recipe because I love fruit and hate sugary, ice cream-made smoothies, and I tend to stay away from dairy so no yogurt either. By the way, I love your sites! your smoothies are similar to mine, but i use a splash of drink yogurt (yes, i'm in japan), a bit of tofu, and a couple of teaspoons of flaxseed oil. i was surprised how tasty the flax is--you would think, ew, oil, but it adds a rich, nutty flavor to the fruit/yogurt/tofu mix. this one really does keep me going till lunch. and in winter i just throw in a few mikan (seedless mandarins), which add a great texture and lots of juice. also frozen blueberries make it easy. I like your smoothies although I prefer frozen juice to ice. It gives more antioxidant power to a smoothie, IMO.